The Premier League has a break this weekend with the FA Cup games coming up. However, it returns to action next week so here are the odds and ratings. Let us know what tips you've got for these games. Some interesting fixtures at both ends of the table so plenty to discuss! One Week to go, but on first View here this could be a nice Weekend in PL Fixtures for us. On first view i like here the Win from Arsenal against WestHam. WestHam in last Games didn´t impressed me and on other Side Arsenal with now in next 4 Games with 2 MUST WIN´s... They play against WestHam,Cardiff and Chelsea + Man City. So if they want a small chance of Place 4 they must win for sure against WestHam and Cardiff. Fulham must show reaction after that terrible out of FA-Cup today and if they have some quality then in my view it is in the Offensive. I like arsenal game for goals, i love bourne/eve match for goals, i adore spurs&mau btts&over. Also I like Lpool to win to nil. It's one of the biggest games in Cardiff's season coming up this weekend when we face Huddersfield at the Cardiff City Stadium in this 3pm kick-off on Saturday. Is it a must-win game for both teams? Not quite. It will certainly have a huge impact on their season whatever the result. Cardiff have got a very strong home record but recent defeats to Manchester United and Tottenham have tempered things slightly. Just 1 goal in their last 3 league games is also an issue for the Bluebirds who still sit just outside the relegation zone in 17th place on 18 points. It's 2 points above Southampton in 18th place so the bums are getting twitchy. Huddersfield are quite frankly having a season to forget. David Wagner's side are rock bottom of the league table with just 10 points. The Terriers are 8 points adrift of safety and relegation back to the Championship is looking more and more likely with every passing game. Defeat here would put another nail in their coffin with the club now having suffered 9 defeats in a row in all competitions. The last win coming in a 2-0 win away to Wolves back on 25th November, 2018. The situation is still the same with Cardiff fans. We're taking each game as it comes. The Tottenham result was disappointing but not entirely surprising. We've only lost 1 of our last 3 league games and there's more quiet optimism than ever that we can actually survive this season. We're expecting a full house for this game so the atmosphere should be rocking. I'm not naive enough to think this is a given. I'm sure Huddersfield thought we were a given when we played them earlier in the season at their place and drew 0-0. I just feel given our performances at home against the teams around us and just above us we should really be looking to win this. It won't be a convincing win but I think we should have enough to sneak the win. @Kenton Schweppes might offer a different view. I wouldn't be shocked if Huddersfield snatched a draw but I'd be very gutted if we didn't get something from this game. @Mindfulness, @Pep004, @MaliMisko12, @betcatalog, @sajtion, @godofhorses, @Tiffy, @waynecoyne, @The Sexless Innkeeper, @Magic0024, @malabgd, @Duke_Tm, @dogmeister, @Arkadi Manucharov, @derbent, @fat, @allyhibs, @6avin24, @discipline, @the bastardian, @Bronxie, @Bett, @KikoCy, @teddybear3011, @markus808, @allthethings, @Kenton Schweppes, @vasilli07, @Dylan Lynch, @neilovan, @JKos, @zemo91, @kulikTS, @mrclubbie, @Judeksi, @Henind666, @Teodore, @kilkenny1, @newjack, @PokerWolf1, @Dave1X2, @real55555, @jazzman02, @Ameer13, @Gedkip, @mcsilks, @MangoTheThird, @Roy The Boy, @DonPaulo, @Duckets, @yossa6133, @sjuesju, @dylanphan, @thfc, @Dboston, @Dr. Florida192, @money44, @1moregoal, @ggm31v, @EuroDream, @cummins91, and @AndreBR, what bets are you guys looking at in this next round of Premier League action? Finally joined the forum after a year of reading your thoughts.Very difficult games this week coming from the FA cup matches..West Ham Arsenal is a no bet result for me.Once bookies give Arsenal these high odds away they rarely come back with anything.Should be a BTTS match though. I love the Cardiff Huddersfield match.Home team for a DNB. I need Arsenal to win as the last leg in a treble. Bournemouth look a bit big to me at 4/1, same points total as Everton and both sides up and down, had some decent away wins earlier in the season, couple of new signings could boost them too. I think Cardiff will edge out Huddersfield but not quite tempted enough at the prices. Huddersfield and Fulham are starting to look like lost causes at the moment, especially Huddersfield. Their form is atrocious at the moment, only 1 win and 1 draw from their last 10 premier league matches. Those last two losses against Fulham and Burnley really must hurt them. So it's at least Cardiff home win for me this gameweek, Burnley home win looks tempting too! A trio of draws. Decent value and even though I backed a Cardiff win, I think you've made some decent calls there. Burnley are a wild cannon at the moment though. Tempted by Brighton +1.5 against Liverpool at 1.99 (BetVictor). Basically because Brighton are good at home and can at least be competitive against Liverpool. Liverpool should win, but hopefully not by a big margin, so hopefully Brighton can cover the handicap. Burnley at 2.4 look a big price to me. Fulham can't be trusted away from home, and even lost at home to Oldham in the cup which must have been demoralising, even with a changed team. 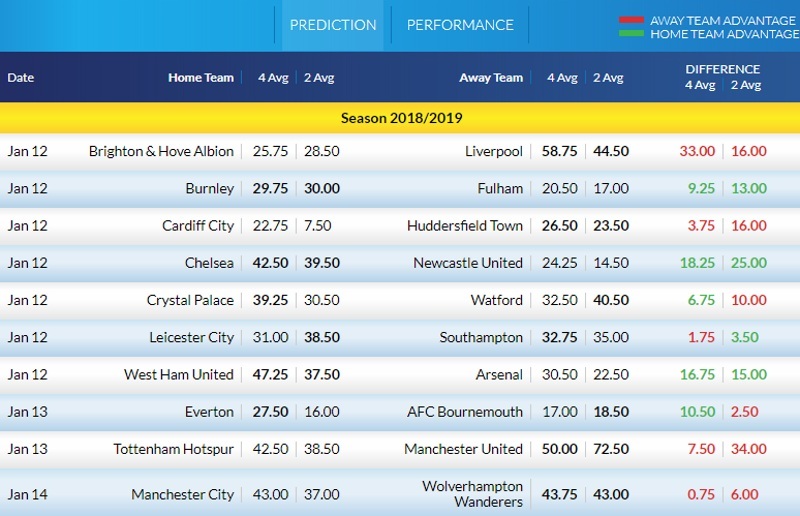 Burnley looking a bit more like the team of last year and given Fulham can't keep goals out I think Burnley are a great bet based on their recent upturn in form. I also think Southampton are capable of getting something against Leicester, who are hit and miss. They remind me a bit of Wolves, i.e. turn up and play against the big teams, and lose at home to Cardiff (and Newport in the cup). Saints are slowly improving, holding Chelsea to a 0-0 draw in their last PL away game, and I think they can get a draw out of this one (3.5 Betfred). I don't know what to think about the spurs man utd game. Spurs looked knackered in the second half against Chelsea while Utd were sunning themselves in Dubai, though maybe they won't be match sharp, at least initially? Spurs haven't lost at home to Utd in the league since 2012 so have a strong recent record against them, even before Poch came in. Gun to head, i'd say a score draw for this one, but I have more fancied bets in the other games so leaving my own team alone this week. whats with all the complications lately? just looking at some statistics you can tell what is what, i don't wanna sound arrogant or cocky but why bother with low end of the table? it's completely random and basically anything can happen. For that matter upper league table offers some nice fixtures for overs. Assuming Spurs will play poorly based of 1 cup match that they won? come on. Spurs racked 14 goals in previous 4 matches. Since Sol UTD in last 5 matches racked 16 goals. Both have tendency to concieve a goal and both average 1,5+ goals per game. Relying on h2h is irrelevant at this point because Man U's play style is different. Spurs will want to welcome this new attacking crazyness and counter of it. Last meeting was 0:3 at the ol' trafford, i bet Utd will want to get points here, i doubt they'll be happy with a draw especially if gunners botch the match vs west ham. Spurs also can afford to drop points. Like i said 2nd game i liked was Pool to win to nil (at the time i said it it was at 2.10, now it's 1.95, I expect to drop to 1.9 come match day). pool on avg concedes 0,64 goals per game when away (that % went slightly up because of city matchup). I can't see Brighton scoring. Liverpool control the match start to finish. Win 0:1 or 0:2 most probable. Goals goals goals. Previous matches between West Ham United and Arsenal have averaged 3.64 goals while BTTS has happened 64% of the time Arsenal hasn't kept a clean sheet when away this season on avg conceding 2,1 goals while scoring 2,2 (when away). Ham scores 1,5 goals on avg at home while conceding 1,6 goals. Kept clean sheet 9% of the time, arsenal 0%. Super easy bet here. Previous matches between Everton and AFC Bournemouth have averaged 3.88 goals while BTTS has happened 75% of the time. This season Bournemouth on avg scores 1,2 goals when away and concedes 2,3 goals. Everton at home scores 1,64 goals and concedes 1,45 goals. Both have kept clean sheets in 20% range while failing to score is also low. (9% Eve). So again I go for goals. West Ham Utd have conceded 2 goals or more in each of their last 3 home matches in Premier League. Arsenal have scored in each of their last 20 matches in Premier League. Brighton & Hove have scored in 100% of their home matches in Premier League. Liverpool have scored in each of their last 11 away matches in Premier League. Fulham have failed to win in their last 11 away matches in Premier League. i'm with @thfc in so much as I don't think Brighton will get thrashed here. I won't argue against the Reds winning, but perhaps only by 1 goal. Brighton have scored in their last 20 league matches at home, and I don't see why that should change here. VIrgil Van Djike is out for the reds with illness, which is a massive plus for us. Brighton have become more offensive of late, and could show their intent early on. My only concern for Brighton is that we are missing Bernardo through injury (left back). 1 win 3 draws 5 losses Aalen Bundesliga 3 2010/11; 4 wins 7 draws 1 loss Ingolstadt Bundesliga 2 2013/14. "They are a strong team and a challenge for us but we are going there to get three points because we need to come out of this relegation zone so we have to get some wins or draws. If it's a draw we take it, if it’s a win it’s better." Southampton's away record of 3 wins 8 draws and 8 losses last season and 2 wins 2 draws 7 losses this season(1/1/1 since new coach) makes me think they will most likely get one point vs the sketchy Foxes. Read picks left,read picks right all playing cardiff`s win so easy. The biggest trap in my opinion. Simply add a table of the last 6 Huddersfield games. So tell me what you see in the table.....?????? Everton conceded at least 1 goal in each of their last 8 matches in Premier League. 67% of Tottenham's matches had over 2.5 goals scored in Premier League. The big game this weekend is coming up this Sunday in a 4:30pm kick-off when Premier League title contenders Tottenham take on a rejuvenated Manchester United at Wembley Stadium. In what will be Ole Gunnar Solskjaer's biggest test yet as the Red Devils manager, can he keep his winning run going? Tottenham are still playing down their roles as title contenders but with the club in 3rd place and just 2 points behind second placed Manchester City it seems unrealistic not to include them in the title talk. The move to the new stadium continues to be delayed and Mauricio Pochettino has said the club has no plans to spend big in January. Are they actually throwing in the towel already, focusing on the Champions League, or simply acting coy? Manchester United are loving life under Solskjaer after the strict stewardship of Jose Mourinho. The club is on a run of 5 consecutive wins in all competitions since the Norwegian manager was appointed in the interim role. However, some have argued that in Cardiff, Huddersfield, Bournemouth. Newcastle, and Reading, Solskjaer is yet to be reasonably tested in his position. A win could potentially move the team into 5th so it's a game they'll be keen to take all three points. If Tottenham win here it will be the first time since 1960 that they would have won three consecutive top flight league games against United. There could also be goals in this one. The two sides have scored 40 goals between them in each of their last 6 competitive matches. Backing Harry Kane to score anytime could be a decent shout. The striker has scored in six consecutive matches and it would be the first time he'd have scored in seven consecutive games if he does so here. His record against top six placed sides is only bettered by Sergio Aguero. I think this could be a real test for United. I think they'll push Tottenham to the limit but I think Pochettino will know how to get his team set up against this new-look attacking United side. We could see a really exciting game if both teams believe they can win but the overall cohesive quality of Spurs should prevail.